I recently released four packs of rejoinders – short expressions that we use in natural conversation to keep the flow of communication moving forward. There are 16 per pack, 64 total. They include a wide variety of natural, authentic expressions selected to empower students to demonstrate their comprehension and contribute to conversation with confidence, style and personality. I’ve color coded them to correspond with the time of the school year that I typically introduce them. During this school year, I’ll be adding posts to the blog to describe I implement rejoinders at these different times. First up, examples from the green set. This set contains staple expressions you would hear in any TPRS® classroom from early on. They’re exclamations, mostly, designed to give students rudimentary options to express a variety of emotions. ¡Qué ridículo! / How ridiculous! ¡Es obvio! / It’s obvious! ¡Qué interesante! / How interesting! What’s the big picture? Our goal isn’t the quiz. While rejoinders, and learning how to use them, would be great for any level language learner, I teach level 1. The perspective I offer here will be presented in the context of classes of true beginners. You can view these expressions as “vocabulary”. However, I prefer to take the long view. I believe that one of the most powerful catalysts that drive people to intermediate levels and beyond is a sense of identity and belonging. Students need to see themselves as language learners. And they need to belong to a community that values language learning. This starts in level 1 as we learn to have mini (but genuine) conversations with each other in the target language. I’m training my students to be polite humans. I’m training them to interact empathetically and conversationally with me and their peers by hearing and understanding what’s being said and responding with appropriate, authentic expressions in the target language. I believe that acquiring a variety of situationally appropriate expressions empowers them to more readily transition from interacting with their initial school-bound classroom community to communicating meaningfully with native speakers. 100% Organic, or is it? I hope, as I share with you how I present these sample rejoinders, that you’ll get a feel for the organic nature of their introduction and the intentional nature of their repetition and mastery. Some of you may be inclined to plan out how you introduce these – four at a time, a poster per week or two. If you do, that’s great! Teach me how! I can’t do it that way. I thrive on the spontaneous, organic nature of human interaction and I try my best to respond in the moment to the moment’s demands. But, that’s not to say I’m unprepared or that my approach lacks intentionality. I’ve done this enough to know that all of these expressions will come up in conversation in the first few weeks of school. So, since that’s the case, we could say it’s a bit of planned spontaneity. I know I’ll be teaching them, I just don’t know exactly when. By having this kind of approach, I like to think that I’m preparing the class for – sewing the seeds of – serendipity. They don’t know what’s coming. I do, but not exactly how or when. As a result, the genuine nature of my response is real and students read it as such. Having a teacher that goes with the flow, instead of cramming a hidden agenda down a student’s throat, engenders excitement, joy and plenty of good will. There’s an excitement inherent in the first weeks of school that makes it easy as pie to introduce many of the green rejoinders. I’m quick to present ¡Es obvio! and ¡Qué ridículo! in the first week, if not the first day! I have to learn kids’ names, and learn them fast. On Day 1, I like to approach one kid and ask her name. I don’t say, “¿Cómo te llamas?” yet, I just look at her, point to her and say, “Beverly?” She shakes her head and says “Mary”. I give a great big, genuine “Oh!”. I walk to the board, commanding the students attention, and write “Se llama Mary / Her name’s Mary”. I turn, look at the class, point to Mary and tell the class, “Clase, se llama Mary!”. At this point, because I’ve failed many times before to make it a requirement that students respond to what I say, I’ve learned I have to demand a response from them that demonstrates comprehension EVERY TIME. Perhaps an ‘oooooh’ or an ‘aaaaaah’ or maybe a ‘si’. A brief clarification in English is OK here, IMHO. I’m training them. I use English for two purposes: to clarify meaning when needed and to make crystal clear my expectations of students. When I go to the next kid, I’ll look for sparkling eyes. I’ll look for a kid who’s inviting me, nonverbally, to address them. I’ll approach, looking him in the eyes, stop, point and ask, “Virgil?”. He shakes his head and says, “Tristan”. I respond with amazement. I turn to laser the words on the board. I say, “Clase, se llama Tristan” in a tone of near disbelief. Again, I demand a response from the class. “Se llama Tristan, clase. Es obvio.” After this first use, because I’m training them to let me know when they don’t understand, someone will give me the signal. I’ll thank them, genuinely, for stopping me. I’ll walk to the board and post the ¡Es obvio! card and write it’s meaning. I face the class, hand near the Spanish and say it for them. “Clase, ¡Es obvio! Se llama Tristan.” Demand a response. I’ll check for comprehension by asking someone to verify what I just said, then continue. I walk to Tristan and put my hand on his shoulder. “Clase, se llama Tristan?” Class responds, “¡Sí!” I pause, smiling and nodding. I turn and laser the card, pausing but not for processing time. After a second or two, a couple real go-getters will say it. I applaud! The class applauds! Still touching Tristan’s shoulder, “Clase, se llama Virgil?” Class shouts, “¡No!” I smile, nod, and say “Correcto, clase. No se llama Virgil…” I draw out the final sound of Virgil while turning toward the board and lasering the card. This time, I only have to begin to turn to laser the board before the go-getters shout out, “¡Es obvio!”. I applaud! The class applauds! They’ve got it. I continue this course for a couple new students, adding in “¿Cómo te llamas?”, “¿Cómo se llama?”, “Me llamo” as I perceive the class can handle it. I’ll establish a few more names, mix them up on purpose, playing the absent-minded professor a bit. Instead of asking if Tristan’s name is Virgil, I’ll state that his name is Virgil, or another name from class that I’ve recently learned. The kids will respond with a strong “¡No!” When that happens, I use the same process to introduce and elicit “¡Qué ridículo!” From then, when I say it wrong, I’ll slap my forehead, turn and touch that card again, triggering them to give me the expression. Side note: Here I’ve used examples that suggest asking the class if Tristan’s name is Virgil. This is delicate territory. Our sense of identity is tied so closely to our names and we don’t know kids well enough to mess with that too much (yet). Kids need to see in our face, in our real, human face, that we are being kind and playful. However, if you teach adolescents, they’ll try to push your boundaries. They might try to suggest that Tristan’s name is Mary. If that happens, my suggested course of action is to stop class immediately, look at the offender, take a step or two in her/his direction and address the whole class saying “[Name of kid] suggested Tristan’s name is Mary. Class, we’re going to play with language in this class. We will use language to laugh together. But we will not use language to hurt. It is never OK in my class to use language as a weapon.” Notice that I’m not recommending you smile and nod. No smiling with this message. After the message, pause. As the class absorbs what you’ve said, bring the smile back and move on. Don’t do what I’ve done so many times and dwell on it. Don’t lecture them for 5 minutes. Short, sweet. Make your point then back to fun. Follow up with junior after class one on one to make sure s/he knows you’re in charge, you want him to be there, but that her/his choice of language will not be tolerated. 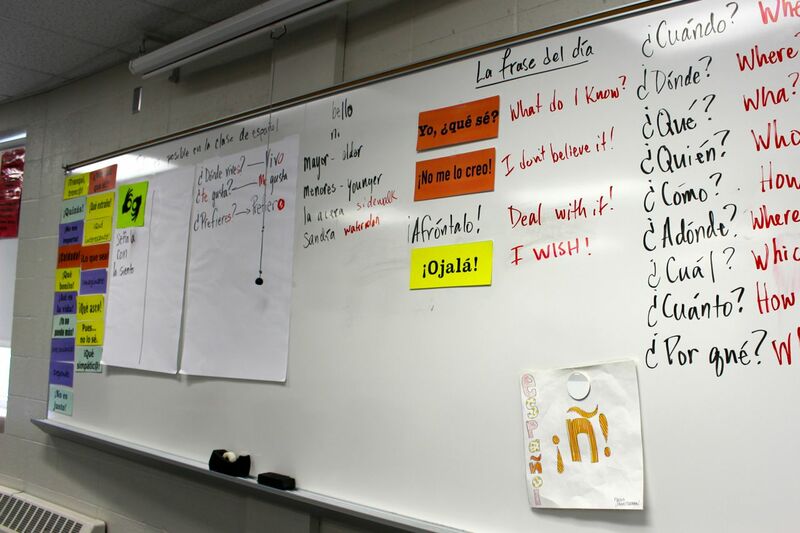 After I start getting “¡Es obvio!” and “¡Qué ridículo!” at appropriate times and without prompting, I’ll move the cards off the white board to another location in the room to begin building my wall of rejoinders (those that are internalized) and set my sites on another. There, they’ll grow over the course of the year and always be there as a resource for you to prompt students if needed or for them to spell correctly if they need it. Below you can see that after a few days at #iFLT15 our word wall (to the left) had grown and we were actively working on others. I’m a big fan of personalizing the classroom. That’s to say, I like to use the target language to get to know who my students are – to talk about what matters most to them: Themselves. It doesn’t take long, using Bryce Hedstrom’s “Persona Especial” or Ben Slavic’s “Circling with Balls” or Karen Rowan’s “Personalization” chapter in the 7th edition of Fluency Through TPR Storytelling, to begin to learn some interesting facts about your students. When you do, you’ll introduce new rejoinders one or two at a time. What’s that? You play soccer? “¡Qué interesante!” When I say this one, I stroke my chin with my thumb and forefinger. This becomes a trigger gesture to elicit the expression. Learn an interesting fact about a student, turn to the class, stroke the beard and wait for them to come back with “¡Qué interesante!”. Suspending realtiy serves many purposes. It’s an invitation to create (in 2015 being creative in school is unheard of in nearly all classroom environments!). It’s an opportunity to raise interest in otherwise mundane details (normal is not compelling!). Finally, it’s the perfect way to introduce new rejoinders. Many observers at #iFLT15 saw me interacting with my real students. If you were there Wednesday, you might have heard me asking Katelyn if she had a dad. She said “Yes.” When I relayed that piece of interesting information to the class, the class replied with known rejoinders. Some said, “¡Qué interesante!” others “¡No lo sabía!” But the next question threw them off. I asked, “¿Cuántos?” or “how many?” I do that intentionally. It’s critical that students feel they’re in a safe space to say they have step moms or dads or two moms or dads. In response to this question, many kids just state how many parents they have, but Katelyn’s eyes sparkled. She knows that todo es posible. She replied that she had 9 dads. If you’re going to solicit cute answers like this, it’s critical that you also honor them. You don’t have to honor responses that are inappropriate, but if it’s acceptable, you have to believe it. Having 9 dads creates opportunities for lots and lots of repetitions. Over the course of the school year we might introduce the class to different dads. We might create their physical appearances, their personalities, their places of employment, etc. Also, more importantly, we begin to create an alternate persona for Katelyn. She begins to love Spanish class because it’s where she gets to pretend she has 9 dads. We also being to create inside jokes, powerful ingredients for building a unified community. Even the kids who have gone to elementary school with Katelyn have NO IDEA that she has 9 dads in Spanish class. These pieces of information are seeds of a community. They bind a class together and help them respect one another and work together toward our unified goal of becoming Spanish speakers. And, of course, it’s moments like these that are perfect moments to introduce expressions of amazement like “¡Imagínate!”. “Pues, no lo sé” is an expression that just means “Well, I don’t know.” But when we define it for our students, we don’t have to give word for word dictionary definitions. I encourage you to be flexible and aware when choosing definitions. Listen for expressions you hear your students use in the hallways. If you hear them saying “Got me!” or “Beats the heck out of me.” Introduce your expression with a definition that might tap into youth culture. With this particular rejoinder, I attach a gesture. It’s a simple gesture that begins with the head turning slightly toward the shoulder while extending the word “pues”. Then, on the “no” of “no lo sé”, I teach students to shrug the shoulder in time with the word “no”. When I ask them how to say, “Beats the heck out of me”, I’ll expect them to give me the body movements with the saying. There’s always something that makes each rejoinder unique. If it’s “¡Qué bonito!”, raise your voice and channel Aunt Bertha squeezing your cheek at the family reunion. If it’s “¡Qué asco!” pucker your face and show your disgust. If it’s “¿En serio?” slap your cheeks like Macauly Culkin in Home Alone. After students have 3-5 in their repertoire, I’ll go back over and review them. But, at this point in the year I don’t feel the need to do any real incentivizing. Our pace is slow. Students are excited and willing. And most of the exclamations happen in unison as I touch or laser the phrase, pause and wait for them to exclaim. In the next entry, I’ll talk about incentivizing kids as the newness of the school year wears off. I always hold them accountable for responding at the right time, with the right rejoinder, using the right tone. I remind them students that they’re learning to communicate in Spanish by listening and responding. These rejoinders give them options that allow them to respond with style, authenticity and personality (and something other than si or no!) and they prepare them to interact authentically with native speakers. If only I’d seen this before the start of school. Thank you. Love the guessing game. This post is fantastic Grant. So many gems that will help me be a better teacher come Sept 8. Love it! It’s fits into any lesson & can help recycle materials! Thank you SO much for sharing!! !